Serve On International Response Team volunteers putting up their Base of Operations in an 'earthquake-hit' village as part of a mock deployment training exercise. It was another sweltering weekend, but there was no rest for our International Response Team volunteers. It was a training week and this month our recruits were in exercise mode, arriving at our Chilmark base late on Friday night ready for a mock deployment after getting a text alert to establish their availability to respond to a 'disaster'. That meant hurriedly but efficiently prepping and loading the tonne of equipment they would need, preparing manifests, checking personal kit, filling in INSARAG fact sheets and heading for check-in at Chilmark ‘airport’. The training team had gone to great lengths to inject some realism, complete with in-flight movie, before the team landed in the ‘earthquake affected area’ at 1.20 am and went about setting up their Base of Operations in the remote field allocated to them by the LEMA. The team who would be first to be tasked at the end of the night’s curfew got two hours sleep while their colleagues completed the setting up of the BoO. Soon after dawn the volunteers were in action in the ‘earthquake-devastated village’, putting into practice their assessment and communication skills, in tandem with James and Molly from the dog team, and assisting operational members of the small USAR team when a ‘casualty’ was located in a ‘collapsed building’. 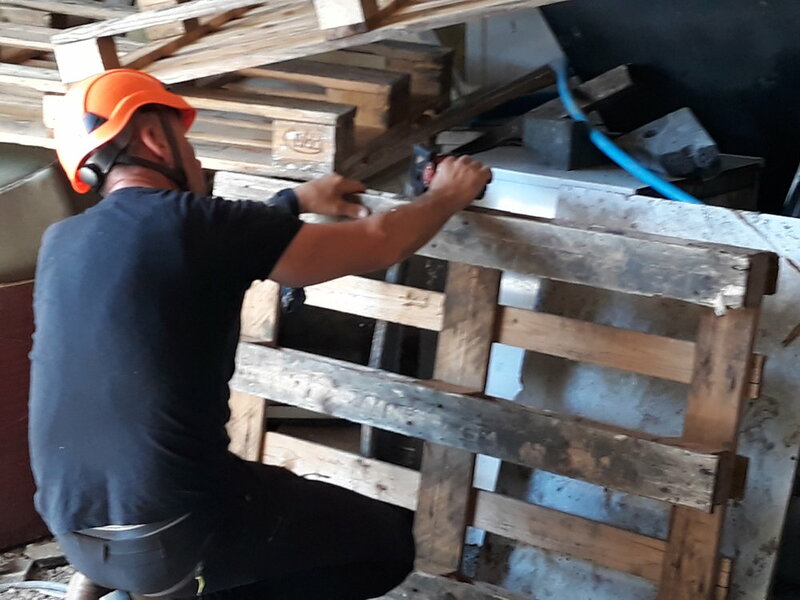 There was time for several of the recruits to get a taster of the breaking and breaching tools being used by the USAR team to get through the solid obstructions blocking their way through the debris of the collapsed ‘basement’. Martin sawing through a wardrobe in confined space. 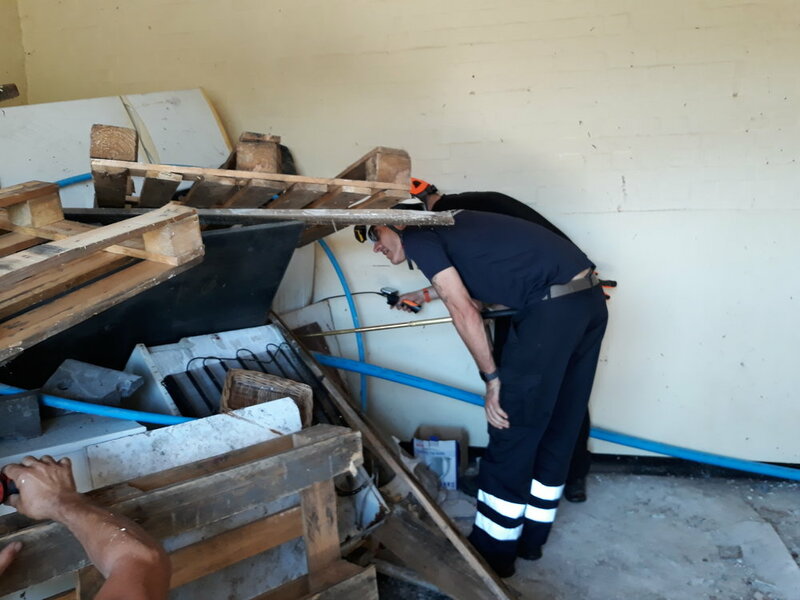 The volunteers also got time using the portable water filtration system and some practice using our technical search equipment to try to find signs of a ‘casualty’ in a rubble pile. It was all valuable experience ahead of more testing training to come, thanks to the excellent work by trainers Tony and Tom to prepare a challenging exercise scenario. Tony, in particular, excelled himself in the building of the walls in the tunnels. Perhaps a new career beckons in construction when he has finished his work as chief pilot at Chilmark airport. 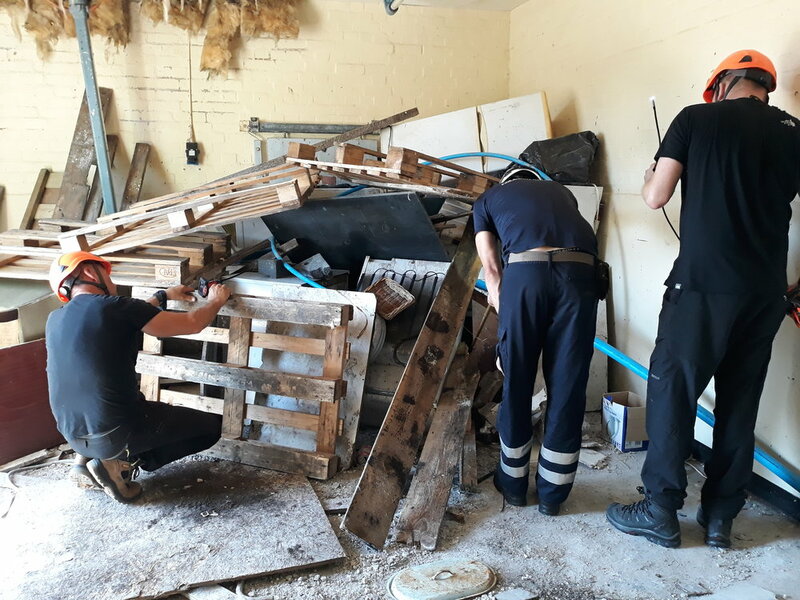 The heat made the weekend particularly hard work but there was some great learning done which will stand the recruit in good stead in future training. Did we say ‘no rest’? Well, maybe there was time for just a bit of shut-eye for the exhausted volunteers before a well-earned barbeque.